Long time since I participated in any contest. Shortage of time or not having clear idea/concept prevented me from submitting entries for many of the Indiblogger contests. Today is last day to submit entry for one of their contests- titled 'Travel Smart with Skyscanner'. It involves writing how we can travel in a smart way and I felt an urge to share my thoughts, and hence below post. is it getting cheapest deals? is it getting to do things/see places no one else managed to? Is it being able to get huge count of likes and shares once you post your trip photos online? Being able to make money from your travel writing and photographs? The definitions would vary depending on individual preferences and objectives. But after all travel, we'll have some very common expectations- that we should feel that the time, money and effort spent on travel was well worth it- that we don't feel cheated and we don't feel disappointed because of poorly planned itinerary. With that in mind, I've listed below thoughts on various aspects you should consider before planning your trip. Do read carefully- these are written in the interest of you-the traveler and not the ones involved in travel business. 1. Study about the destination you intend to visit. Never plan a trip blindly. Experiences, cost and lot of factors depend on season, how early you plan and dozen other parameters. -If you’re impressed by some nice photo on social network and decide to visit the place expecting same scenery, you might be disappointed. You should understand when and how the photographer clicked it and what post processing was done. 3. Selecting Right package: Be careful about n nights/n+1 days package, which has first day only for arrival and last day only for departure. You’ll essentially loose two days for nothing in such schemes. In most of the cases it is possible to arrive early in the morning and explore some places on Day 1 itself. Similarly if you can take a late evening flight back, you can cover some more places on last day. So if you wish to optimize your travel, ask for a customized package. 4.Be careful about ‘Day at leisure’: Several multi day holiday packages will have more than one “Day at leisure” , which simply means operator won’t take you anywhere but you can pay extra to avail some add on trips. Don’t get fooled by well-crafted words like ‘today you’ll spend a day at leisure in lush green environment overlooking the majestic river…’ Of course I am not saying Not to relax at the hotel without venturing out, but just want you to understand that day at leisure is not a blessing given by the package. 5. Hotels with 24 hour check in- I prefer to go for hotels which count a day as 24 hours from my check-in time. Unfortunately such hotels are very difficult to find online. Most hotels adopt a 12 noon check-in and 10am check out policy, charging extra for early check in or late checkout. In such cases, if you need to arrive early or leave late, instead of booking an extra day, you might be able to manage by checking out on time (most hotels relax check in/check out time by few hours if there’re no other guests for the room) and using hotel’s cloak room to keep your luggage in, while you may go out and explore. 6.Taxi is not needed for everything: Most of the tourist places can often be covered by public transport. Figure out what are the places which are well connected by bus/train and plan to explore them on your own, instead of taking service of a taxi and tour guide. Traveling by metro or public transport gives you lots of understanding about the city and helps you understand your bearings (how to go from one place to another). In a rented taxi you’ll be almost clueless while you’re driven to the destination. 7. Sometimes train travel could be far effective than flight. For example, between Chennai and Bengaluru- a distance of 400 kms, a flight trip takes same time end to end compared to Shatabdi express (2 hour check-in time, 1 hour flight time, another hour to reach city from airport, for about Rs 3000 onwards, where as Shatabdi express takes you to your destination for one fourth the price but with an hour more of travel time. Similarly, if you try searching for a flight between Pune and Mumbai, travel sites won’t tell you take a train. Instead they offer stupid connects which involves flying to a far off city like Hyd and then taking another flight to Mumbai. (of course there is a direct flight between Mumbai and Pune) Do your homework be referring maps. 8 Alternative to hotel booking: It is not necessary to book a room in advance all the time. During off peak seasons, lots of hotels will be empty and you can just walk in any time. Not booking in advance gives you better flexibility on your itinerary. Of course you can book in advance to be safe, lots of time I speak to hotels and ask them to block a room for me or ask if I can walk in. Most of the time they agree. Homestays and couchsurfing are other alternatives to hotel stay. The more adventurous of you should consider camping. 9. Be vary of ‘Complementary visit to Souvenir shop’. If your tour operator has planned to waste half a day of your time with ‘Complementary visit to Souvenir shop’, you should say NO to such itineraries. Almost always these are the shops where travel agent gets commission from and need not be in your best interest. 10. Avoid getting conned or minimize impact of a theft: In a strange country, you’ll never know how disaster may strike. Avoid keeping all your valuables in one place. Keep a secondary wallet with little money and few expired cards. Should you be robbed, or such incident happens, you should be able to recover quickly and carry on with your original plan, without breaking down after losing all money and documents. 11. Be vary of services that need you to deposit your passport. 2 passengers onboard MH370 were using stolen passports and the passports were stolen in Thailand while they were deposited as security during bike rentals. So if you’re indulging in such transactions, ensure that you’re dealing with known/reliable parties and not some roadside vendor. 12. There will be places you can explore early morning- such as beaches, parks etc. Your tour operator won’t usually add that to your plan, because most tourists prefer to get up at leisure and start their day after breakfast. However, if you wish to maximize your experience, find out places which open early morning and cover them before breakfast. Crowd will be less and you will have nice experience. 14. 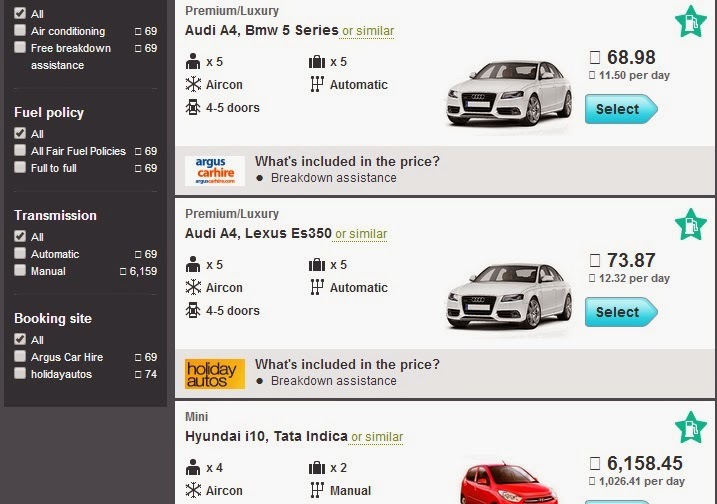 Book smart: It is good idea to compare prices using aggregators like Skyscanner. Do check my other post to understand how travel sites make money, to learn about precautions you’ll have to take. · Which operator in India has Citroen C1 or Peugeot 107 or Dodge Grand Caravan on their fleet? These cars are not sold in India and European names/categories seem to be copied blindly. · When they asked Driver’s age in the first page, I was under the impression that it is self drive. But none of the cab operators from whom taxi rentals are fetched have self drive. Probably this will be fixed over time, as Skyscanner adapts their European model website to meet Indian business scenarios. I almost fell off my chair when I saw that a Lexus Es350 is listed at Rs 103.78 for 33 days in Pune on the website of Holiday Autos. In all probability a data mistake.